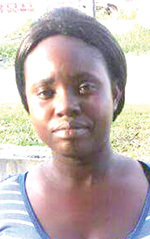 In what is being described as a murder-suicide, a man reportedly lured his 26-year-old estranged partner to his Lot 1 Beterverwagting Railway Embankment, East Coast Demerara home and hacked her to death before setting the house on life. 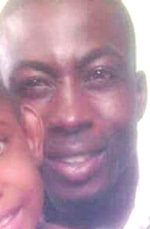 The charred bodies of Latoya Telford, Leonard Pollard, 34, and his one-year-old daughter, Nakasia Pollard, were found in the burnt-out building that was set alight at around 02:30hrs yesterday. Pollard and Latoya Telford, who had three children, separated last November after his mother instructed Pollard to vacate her home to accommodate a relative. Kaieteur News was informed that the woman and her children moved to her mother’s La Parfaite Harmonie, West Bank Demerara (WBD) home and would sometimes take the children to visit their father. 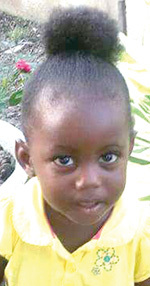 On Saturday afternoon, Telford allegedly left her mother’s home with little Nakasia to visit Pollard at his Beterverwagting home. It is unclear what transpired between the couple at the property but firefighters alleged that when they picked up the burnt remains, the body of one adult was in parts, suggesting that the woman might have been hacked before the fire started. There are no immediate neighbours, so no one heard any screams. According to information, the murder-suicide may have stemmed from a text message Pollard found in his estranged partner’s phone. The message was reportedly from a man. Leon Pollard revealed that his sibling called him Saturday midday and informed him that Telford was coming over, but claimed that he warned his brother against having her there because his mother does not want her at the house. The sibling said that he expected something like this would have occurred because of the way the couple was living. Telford had reportedly moved to her mother’s place on four previous occasions. Residents at a wash bay opposite the burnt house said that Pollard, who allegedly “loved” his marijuana, went over to borrow a bicycle to go to the shop. He claimed that he couldn’t find his cycle. This newspaper was told upon his return, he had a bottle, suspected to be gasoline, wrapped in a plastic bag and a pumpkin. Residents suspected that he might have cooked and allowed her to eat before he went on his killing spree. The woman’s mother, Rakhael Meredith, said that she was shocked when she received a call yesterday morning that her daughter was burnt in a fire at Beterverwagting, since she left Latoya at home on Saturday night. Reports are that the mother of three informed a relative that she was going to the city to visit a friend. She took her daughter with her. This newspaper was informed that the relatives had repeatedly warned Telford not to visit her partner, since he had threatened to kill her. Telford’s aunt, Sharon Price, said that only last Friday, her niece attended a job interview at the Guyana Fire Service. “She was trying save and buy a land so that she and her children them can have a place of their own. Her husband doesn’t work and give her money and that is also one of the reasons why she left his home too,” the woman alleged. Price explained that Pollard’s mother had sent for him to go to Barbados and when he returned to Guyana, he stopped working. “He and Latoya always having problems and then his mother wanted her to move from the house so that she other son can move in so, she eventually moved,” the relative said. The police are awaiting a post mortem examination to determine whether the woman was indeed hacked to death. 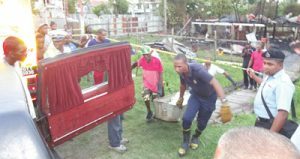 On January 23, last, eight-month-old Romain Seth was burnt to death when a gang of young men allegedly torched his grandmother’s Kaneville, East Bank Demerara (EBD) home.